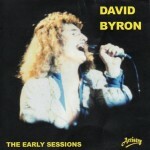 The first CD from the series “David Byron — The Early Sessions 1968-70″ was released on January 29, 2012, the date of David Byron’s birthday. David would have turned 65 today. This first long awaited release of Avenue Records contains 22 tracks which David recorded as session vocalist in late ’60s and early ’70s for Avenue Records. These tracks, originally released on 7” vinyl, were remastered and restored from the original master tapes.